Cambridge Analytica Ltd (CA) was a British political consulting firm which combined data mining, data brokerage, and data analysis with strategic communication during the electoral processes. It was started in 2013 as an offshoot of the SCL Group. The company closed operations in 2018 in the course of the Facebook–Cambridge Analytica data scandal, although related firms still exist. The company was partly owned by the family of Robert Mercer, an American hedge-fund manager who supports many politically conservative causes. The firm maintained offices in London, New York City, and Washington, DC. CEO Alexander Nix has said CA was involved in 44 US political races in 2014. In 2015, CA performed data analysis services for Ted Cruz's presidential campaign. In 2016, CA worked for Donald Trump's presidential campaign as well as for Leave.EU (one of the organisations campaigning in the United Kingdom's referendum on European Union membership). CA's role in those campaigns has been controversial and is the subject of ongoing criminal investigations in both countries. Political scientists question CA's claims about the effectiveness of its methods of targeting voters. In March 2018, multiple media outlets broke news of Cambridge Analytica's business practices. The New York Times and The Observer reported that the company had acquired and used personal data about Facebook users from an external researcher who had told Facebook he was collecting it for academic purposes. Shortly afterwards, Channel 4 News aired undercover investigative videos showing Nix boasting about using prostitutes, bribery sting operations, and honey traps to discredit politicians on whom it conducted opposition research, and saying that the company "ran all of (Donald Trump's) digital campaign". In response to the media reports, the Information Commissioner of the UK pursued a warrant to search the company's servers. Facebook banned Cambridge Analytica from advertising on its platform, saying that it had been deceived. On 23 March 2018, the British High Court granted the Information Commissioner's Office a warrant to search Cambridge Analytica's London offices. The personal data of approximately 87 million Facebook users were acquired via the 270,000 Facebook users who used a Facebook app called "This Is Your Digital Life." By giving this third-party app permission to acquire their data, back in 2015, this also gave the app access to information on the user's friends network; this resulted in the data of about 87 million users, the majority of whom had not explicitly given Cambridge Analytica permission to access their data, being collected. The app developer breached Facebook's terms of service by giving the data to Cambridge Analytica. On 1 May 2018, Cambridge Analytica and its parent company filed for insolvency proceedings and closed operations. Alexander Tayler, a former director for Cambridge Analytica, was appointed director of Emerdata on 28 March 2018. Cambridge Analytica (SCL USA) was incorporated in January 2015 with its registered office in Westferry Circus, London and just one staff member, its director and CEO Alexander James Ashburner Nix (also appointed in January 2015). Nix is also the director of nine similar companies sharing the same registered offices in London, including Firecrest technologies, Emerdata and six SCL Group companies including "SCL elections limited". Nigel Oakes founded SCL Group, which is the parent company of Cambridge Analytica. Cambridge Analytica CEO Alexander Nix speaking in November 2017. Publicly, SCL Group called itself a "global election management agency", Politico reported it was known for involvement "in military disinformation campaigns to social media branding and voter targeting". SCL's involvement in the political world has been primarily in the developing world where it has been used by the military and politicians to study and manipulate public opinion and political will. Slate writer Sharon Weinberger compared one of SCL's hypothetical test scenarios to fomenting a coup. Cambridge Analytica was founded by conservative businessmen Steve Bannon and Robert Mercer. A minimum of 15 million dollars has been invested into the company by Mercer, according to The New York Times. Bannon's stake in the company was estimated at 1 to 5 million dollars, but he divested his holdings in April 2017 as required by his role as White House Chief Strategist. In March 2018, Jennifer Mercer and Rebekah Anne Mercer became directors of Emerdata limited. In March 2018 it became public by Whistleblower Christopher Wylie, that Cambridge Analytica's first activities were founded on a data set, which its parent company SCL bought 2014 from a company named Global Science Research founded by Aleksandr Kogan who worked as an psychologist at Cambridge. Per the Associated Press, Data Propria, a data analysis firm launched May 2018, is run by former officials at Cambridge Analytica. In July 2018, several former Cambridge Analytica staff launched Auspex International, a company intended to influence politics and society in Africa and the Middle East. CA's data analysis methods were to a large degree based on the academic work of Michal Kosinski. In 2008, Kosinski had joined the Psychometrics Centre of Cambridge University where he then developed with his colleagues a profiling system using general online data, Facebook-likes, and smartphone data. He showed that with a limited number of "likes", people can be analysed better than friends or relatives can do and that individual psychological targeting is a powerful tool to influence people. CA would collect data on voters using sources such as demographics, consumer behaviour, internet activity, and other public and private sources. According to The Guardian, CA used psychological data derived from millions of Facebook users, largely without users' permission or knowledge. Another source of information was the "Cruz Crew" mobile app that tracked physical movements and contacts and according to the Associated Press, invaded personal data more than previous presidential campaign apps. Today in the United States we have somewhere close to four or five thousand data points on every individual ... So we model the personality of every adult across the United States, some 230 million people. —  Alexander Nix, chief executive of Cambridge Analytica, October 2016. The company claimed to use "data enhancement and audience segmentation techniques" providing "psychographic analysis" for a "deeper knowledge of the target audience". The company uses the Big Five model of personality  Using what it calls "behavioral microtargeting" the company indicates that it can predict "needs" of subjects and how these needs may change over time. Services then can be individually targeted for the benefit of its clients from the political arena, governments, and companies providing "a better and more actionable view of their key audiences." According to Sasha Issenberg, CA indicates that it can tell things about an individual he might not even know about himself. CA derived much of its personality data on online surveys which it conducts on an ongoing basis. For each political client, the firm would narrow voter segments from 32 different personality styles it attributes to every adult in the United States. The personality data would inform the tone of the language used in ad messages or voter contact scripts, while additional data is used to determine voters' stances on particular issues. The data would get updated with monthly surveys, asking about political preferences and how people get the information they use to make decisions. It also covered consumer topics about different brands and preferred products, building up an image of how someone shops as much as how they vote. Channel 4 News, a news programme broadcast by the British public service Channel 4, conducted a four-month investigation into Cambridge Analytica starting in November 2017. An undercover reporter posed as a potential customer for Cambridge Analytica, hoping to help Sri Lankan candidates get elected. Video footage from this operation was published on 19 March 2018. From the footage, Cambridge Analytica executives say they worked on over 200 elections across the world. Alexander Nix was recorded in this investigation, talking "unguardedly about the company's practices". Nix said that his company uses honey traps, bribery stings, and prostitutes, for opposition research. For example, Nix offered to discredit political opponents in Sri Lanka with suggestive videos using "beautiful Ukrainian girls" and offers of bribes, even if the opponents did not accept the offers. Cambridge Analytica said that the video footage was "edited and scripted to grossly misrepresent" the recorded conversations and company's business practices. Nix said that he had "entertained a series of ludicrous hypothetical scenarios", but insisted his company does not engage in entrapment or bribery. In the third part of the series, Nix also said that Cambridge Analytica "ran all the digital campaign" for Trump. Nix stated they used communications that would be self-destructive, leaving no incriminating evidence. After the news segment was broadcast, the board of Cambridge Analytica suspended Nix as chief executive officer. The company also released a statement that the allegations did not represent the ethics of the company, and an independent entity would investigate Nix's statements. The investigation also raised questions regarding campaign finance law. During the 2016 election, the company was employed both by Trump's campaign and Robert Mercer's Make America Number 1 Super PAC which supported Trump. While PACs are not limited in the amount of funds they can spend on behalf of a candidate, they are not allowed to coordinate strategy with the campaigns they are supporting. Nix's statements in the recorded video describe how the Trump campaign itself could "take the high road" and "stay clean", while the negative attacks were handled by the firm and the Super PAC, in a way which makes it "unattributable, untrackable". These statements potentially suggested unlawful coordination between Trump's campaign and the PAC, although Cambridge Analytica has denied this. Political scientists have been highly skeptical of claims made by Cambridge Analytica about the effectiveness of its microtargeting of voters (microtargeting refers to the process of "analyzing data to predict the behavior, interests, and opinions held by specific groups of people and then serving them the messages they're most likely to respond to"). Political scientists note that access to digital data is not going to provide significantly more information than from public voter databases, and the digital data has limited value over time as the preferences of voters change. Political scientists also note that it is hard to infer political values from personality traits, which means that it is easy to mistarget the messages that are sent to voters with specific personality traits. Research discussed by Brendan Nyhan of Dartmouth College showed that it is extremely hard to alter voters' preferences because many likely voters are already committed partisans; as a result, it is easier to simply mobilize partisan voters. Tufts University political scientist Eitan Hersh, who has published on microtargeting in campaigns, has expressed strong skepticism about Cambridge Analytica's methods and their purported effectiveness, saying "Every claim about psychographics etc made by or about [Cambridge Analytica] is BS." In 2017, CA claimed that it has psychological profiles of 220 million US citizens based on 5,000 separate data sets. In March 2017, The New York Times reported that CA had exaggerated its capabilities: "Cambridge executives now concede that the company never used psychographics in the Trump campaign." Trump aides have also disputed CA's role in the campaign, describing it as "modest" and noting that none of the company's efforts involved psychographics. According to an aide and consultant for Ted Cruz's presidential campaign, their campaign stopped using CA after its psychographic models failed to identify likely Cruz supporters. The Cruz campaign ceased access to all of Cambridge's data after the South Carolina Republican primary on 20 February 2016 when Cruz came in third after Trump and Rubio. The use of personal data collected without knowledge or permission to establish sophisticated models of user's personalities raises ethical and privacy issues. CA operated out of the United States; its operations would be illegal in Europe with its stricter privacy laws. While Cruz was outspoken about protecting personal information from the government, his database of CA has been described as "political-voter surveillance". Regarding CA's use of Facebook users, a speaker for CA indicated that these users gave permission when signing up with the provider, while Facebook declared that "misleading people or misusing information" is in violation of Facebook's policies. In 2015, Facebook indicated that it was investigating the matter. In March 2018, Facebook announced that it had suspended the accounts of Strategic Communication Laboratories for failing to delete data on Facebook users that had been improperly collected. Alexander Nix suggested that data collection and microtargeting benefits the voters – because they receive messages about issues they care about. However, digital rights protection groups raised concerns that private information is collected, stored, and shared while individuals are "left in the dark about [it]" and have no control. Significant backlash against Facebook came to light in March 2018, resulting in controversy as well as a $37 billion drop in the market capitalization of Facebook, as of 20 March. Due to the scandal of enabling monetization of Facebook personal data, one assessment was that only 41% of Facebook users trust the company. On 26 March, the US Federal Trade Commission announced it is "conducting an open investigation of Facebook Inc's privacy practices following the disclosure that 50 million users' data got into the hands of political consultancy Cambridge Analytica. "In March 2019 Facebook acknowledged it had concerns about “improper data-gathering practices” by CA, months before the previously reported onset-of-alert at December 2015. In India, Cambridge Analytica had been used by the two largest political parties, BJP and Congress (INC) to carry out "in-depth electorate analysis" and influence voters, including in the 2010 elections to the Bihar Legislative Assembly. 355 Indian Facebook users installed a Cambridge Analytica app, exposing the data of 562,455 users. In addition, Christopher Wylie, the Cambridge Analytica whistleblower, alleged that the company has offices and staff in India, and that the Indian National Congress party was a major client. A BBC documentary clip showing a poster of the Indian National Congress in the office of former Cambridge Analytica expert Christopher Wylie went viral in India, sparking accusations that the company was manipulating both mainstream and social media in order to subvert Indian voters away from the Bharatiya Janata Party and towards the INC as part of a neocolonial effort to undermine Indian politics in favor of vested interests. In early 2018 Cambridge Analytica made a 50-page proposal for the INC for both the upcoming 2019 general election in India and their upcoming electoral campaign for the Indian states of Karnataka, Chhattisgarh and Madhya Pradesh state elections in 2018. CA ran campaigns in secret during Kenya's 2013 and 2017 elections. In 2018, a CA employee said that his predecessor at the company had been found dead in his hotel room in Kenya while working on Uhuru Kenyatta's 2013 campaign. The company claimed on its website to have conducted a survey of 47,000 Kenyans during the 2013 elections in order to understand "key national and local political issues, levels of trust in key politicians, voting behaviours/intentions, and preferred information channels". According to verified sources, CA worked with 360 Media a company formed by Simon Gicharu founder of Mount Kenya University and Tom Mshindi Editor in Chief of Nation Media Group. Gicharu's 360 developing online campaigns in the 2017 Kenyan elections portraying "Raila Odinga as a blood-thirsty individual who is also sympathetic to Al-Shabaab and having no development agenda," whilst portraying the incumbent President Kenyatta as "tough on terrorism, and being good for the economy." After the revelations in March 2018, where CA staff boasted of their power in Kenya, opposition figures called for an investigation. Norman Magaya, an official of the National Super Alliance, accused CA and the ruling Jubilee Party of committing a crime and called for an investigation. The ruling Jubilee Party downplayed CA's role, saying it had hired the firm's parent company, to assist with branding. In its Disinformation and 'fake news' inquiry, published on 29 July 2018, the UK Parliament's Digital, Culture, Media and Sport Committee noted that it is believed that CA, or its associated companies, worked with the Labour Party in Malta, on the 2013 general election campaign. Several sources claim, including assassinated journalist Daphne Caruana Galizia, that CA had close relationships with Henley & Partners who would immediately after the election introduce and run a lucrative Citizenship by Investment Program in Malta. The Maltese Government issued a press release denying the claims and calling the report and its sources "fake news". Henley & Partners denied any wrongdoing. According to Henley & Partners, there was never a formal working relationship with CA. "SCL certainly had meetings in Malta, that Christian Kalin of Henley & Partners was introduced by SCL to Joseph Muscat in 2011, and that Christian Kalin met with both political parties before 2013". After the Facebook scandal involving Cambridge Analytica, Forbes published that the British news program Channel 4 News had mentioned the existence of proof revealing ties between the PRI and Cambridge Analytica, suggesting a modus operandi similar to the one in the United States. According to Channel 4 News' Guillermo Galdos, CA worked for the PRI at least until January 2018. An investigation was requested. In 2017 the company had reached out to PRI, Mexico's ruling political party, in order to bolster the party's presidential campaign during the largest-ever political elections of 2018. The party decided that it was sufficiently equipped to mess with the election on its own, but still paid Cambridge Analytica to prevent it from working with rival parties. Many donors to the UK Conservative Party reportedly have connections to the parent company of Cambridge Analytica. CA became involved in the 2016 Brexit referendum supporting "persuadable" voters to vote for leaving the European Union. Articles by Carole Cadwalladr in The Observer and Guardian newspapers, respectively published in February and May 2017, speculated in detail that CA had influenced both the Brexit/Vote Leave option in the UK's 2016 EU membership referendum and Trump's 2016 US presidential campaign with Robert Mercer's backing of Donald Trump being key. They also discuss the legality of using the social data farmed. CA is pursuing legal action over the claims made in Cadwalladr's articles. No campaign contributions, in cash or in kind, by Cambridge Analytica were reported to the UK electoral authorities. Both CA and Leave.eu refused to comment on any donation of services. On 23 March 2018, it was reported that a former employee, Brittany Kaiser, who was the company's former director of business development, has revealed that the company misled the public and MPs over its links with Leave.EU and the analysis of data which had been provided by UKIP. She said she felt she had lied by supporting Cambridge Analytica's company line that it had done "no paid or unpaid work" for Leave.EU. "In my opinion, I was lying. In my opinion I felt like we should say, 'this is exactly what we did'". The following day, it was reported that the company claimed that it would be able to affect the outcome of the Referendum and that it had produced a 10-page document headed "Big Data Solutions for the EU Referendum", claiming it could single out 'Brexiteers' among voters, donors, politicians and journalists. DW reported in March 2018 that "Whistleblower Christopher Wylie told UK lawmakers during a committee hearing on Tuesday that a firm linked to Cambridge Analytica helped the official Vote Leave campaign [the official pro-Brexit group headed by Boris Johnson and Michael Gove] circumvent campaign financing laws during the Brexit referendum." Laurence Levy, a lawyer with the law firm Bracewell & Giuliani, advises Rebekah Mercer, Steve Bannon, and Alexander Nix on the legality of their company, Cambridge Analytica, being involved in U.S. elections. He advises that Nix and any foreign nationals without a green card working for the company must not be involved in any decision making regarding any work the company performs for any clients related to U.S. elections. He further advises Nix to recuse himself from any involvement with the company's U.S. election work because he is not a U.S. citizen. CA had entered the US market in 2012 (or 2013), and was involved in 44 US congressional, US Senate and state-level elections in the 2014 midterm elections. The company worked with the John Bolton Super PAC on a major digital and TV campaign focused on senate races in Arkansas, North Carolina and New Hampshire and helped turn out voters for the Republican candidates in those states. Two of the Republican candidates backed by the Bolton Super PAC, Thom Tillis in North Carolina and Tom Cotton in Arkansas, won their Senate bids, while Scott Brown lost in New Hampshire. The PAC ran 15 different spots each in North Carolina and Arkansas and 17 in New Hampshire, mostly online with some targeted directly to households using Dish and DirecTV. All were intended to push Bolton's national security agenda. CA also supported Thom Tillis's successful campaign to oust Kay Hagan as a senator for North Carolina. The firm was credited for its role in identifying a sizeable cluster of North Carolinians who prioritised foreign affairs, which encouraged Tillis to shift the conversation from state-level debates over education policy to charges that incumbent Kay Hagan had failed to take ISIS's rise seriously. Tillis's campaign and the North Carolina Republican Party paid Cambridge Analytica $345,000 for these services. CA sent dozens of non-U.S. citizens to provide campaign strategy and messaging advice to Republican candidates in 2014, opening the firm and individuals to prosecution under the Foreign Agents Registration Act, for being foreign agents having not registered through the United States Department of Justice as such. CA's involvement in the 2016 Republican Party presidential primaries became known in July 2015. As of December 2015, CA claimed to have collected up to 5,000 data points on over 220 million Americans. At that time Robert Mercer was a major supporter of Ted Cruz. The Mercer family funded CA directly and indirectly through several super-PACs as well as through payments via Cruz's campaign. Ted Cruz became an early major client of CA in the 2016 presidential campaign. Just prior to the Iowa caucuses, the Cruz campaign had spent $3 million for CA's services, with additional money coming from allied Super-PACs. After Cruz's win at the Iowa caucus CA was credited with having been able to identify and motivate potential voters. Ultimately the Cruz campaign spent $5.8 million on work by CA. Ben Carson was a second client of CA; his campaign had paid $220,000 for "data management" and "web service" as reported in October 2015. Marco Rubio's campaign was supported by Optimus Consulting. Meanwhile, the third competitor, Governor John Kasich, was supported by rivalling firm Applecart. In 2016, the company said that it had not used psychographics in the Trump presidential campaign. Cambridge Analytica targeted potential voters with bespoke messages. Cambridge Analytica's data head, Alexander Tayler said, "When you think about the fact that Donald Trump lost the popular vote by 3m votes but won the electoral college vote, [t]hat's down to the data and the research." The head of Cambridge Analytica said he asked WikiLeaks founder, Julian Assange, for help finding Hillary Clinton's 33,000 deleted emails. On 18 May 2017, Time reported that the US Congress was investigating CA in connection with Russian attempts to interfere in the 2016 presidential election. The report alleges that CA may have coordinated the spread of Russian propaganda using its microtargetting capabilities. According to the Trump campaign's digital operations chief, CA worked "side-by-side" with representatives from Facebook, Alphabet Inc. and Twitter on Trump's digital campaign activities. On 4 August 2017, Michael Flynn, who is under investigation by US counterintelligence for his contacts with Russian officials, amended a public financial filing to reflect that he had served in an advisory role in an agreement with CA during the 2016 Trump campaign. On 8 October 2017, Brad Parscale, who was the digital media director for Donald Trump's 2016 presidential campaign, stated in an interview with Lesley Stahl from CBS News on 60 Minutes that Parscale was able to utilize Facebook advertising to directly target individual voters in swing states. Parscale cited the example in which he was able to target specific universes (audiences) who care about infrastructure and promote Trump and his message to build back up the crumbling American infrastructure. Although he hired Cambridge Analytica to assist with microtargeting, and Cambridge Analytica stated that it was the key to Trump's victory, Parscale denied that he gained assistance from the firm, stating that he thought Cambridge Analytica's use of psychographics doesn't work. He also denied any assistance with links to Russia. According to Parscale, the Clinton Campaign turned down assistance from these platforms. On 25 October 2017, Julian Assange said that on Twitter that he had been approached by Cambridge Analytica, but said he had rejected its proposal. Assange's tweet followed a story in The Daily Beast alleging that Cambridge Analytica chief executive Alexander Nix had proposed a collaboration with Wikileaks to find the 33,000 emails that had been deleted from Clinton's private server. CNN said it had been told by several unnamed sources that Nix intended to turn the Clinton email archive released to the public by the State Department into a searchable database for the campaign or a pro-Trump political action committee. On 14 December 2017, it was revealed that Robert Mueller had requested during the fall of 2017 that Cambridge Analytica turn over the emails of any of its employees who worked on the Trump campaign, as part of his investigation into Russian interference in the 2016 United States elections. In 2018, following disclosures that the company had improperly used the personal information of over 50 million Facebook users while working on Trump's presidential campaign, the Times of Israel reported that the company had used what Nix had called "intelligence gathering" from British and Israeli companies as part of their efforts to influence the election results in Trump's favor. Cambridge Analytica's executives said in 2018 that the company had worked in more than 200 elections around the world, including in Nigeria, the Czech Republic and Argentina. ^ a b Cheshire, Tom (21 October 2016). "Behind the scenes at Donald Trump's UK digital war room". Sky News. ^ Cadwalladr, Carole (18 March 2018). "'I made Steve Bannon's psychological warfare tool': meet the data war whistleblower". The Guardian. Retrieved 18 March 2018. ^ Illing, Sean (16 October 2017). "Cambridge Analytica, the shady data firm that might be a key Trump-Russia link, explained". Vox. Retrieved 24 March 2018. ^ "Cambridge Analytica LLC: Private Company Information". Bloomberg. Retrieved 20 March 2018. ^ Editorial, Reuters (20 March 2018). "Factbox: Who is Cambridge Analytica and what did it do?". U.S. Retrieved 23 March 2018. ^ "Exposed: Undercover secrets of Trump's data firm". Channel 4 News. 20 March 2018. Retrieved 22 March 2018. ^ a b c d e Issenberg, Sasha (12 November 2015). "Cruz-Connected Data Miner Aims to Get Inside U.S. Voters' Heads". Bloomberg. Retrieved 2 February 2016. ^ "Cambridge Analytica staff set up new firm". BBC News. 2018-07-12. Retrieved 2018-12-24. ^ a b c d e Vogel, Kenneth (7 July 2015). "Cruz partners with donor's 'psychographic' firm". Politico. Retrieved 27 December 2015. ^ a b c "About Us". Cambridge Analytica. Archived from the original on 16 February 2016. Retrieved 27 December 2015. ^ a b c Sellers, Frances Stead (19 October 2015). "Cruz campaign paid $750,000 to 'psychographic profiling' company". The Washington Post. Retrieved 7 February 2016. ^ Alex Altman (10 October 2016). "Silent Partners". Time: 44. ^ a b c d Confessore, Nicholas; Hakim, Danny (6 March 2017). "Data Firm Says 'Secret Sauce' Aided Trump; Many Scoff". The New York Times. ISSN 0362-4331. Retrieved 7 March 2017. ^ Reinbold, Fabian; Schnack, Thies (6 December 2016). "Ich ganz allein habe Trump ins Amt gebracht". Der Spiegel. ^ Doward, Jamie; Cadwalladr, Carole; Gibbs, Alice (4 March 2017). "Watchdog to launch inquiry into misuse of data in politics". The Guardian. ISSN 0261-3077. Retrieved 14 June 2017. ^ a b c d e "Cambridge Analytica's Facebook data abuse shouldn't get credit for Trump". The Verge. Retrieved 20 March 2018. ^ a b Trump, Kris-Stella (23 March 2018). "Analysis | Four and a half reasons not to worry that Cambridge Analytica skewed the 2016 election". Washington Post. ISSN 0190-8286. Retrieved 23 March 2018. ^ Rosenberg, Matthew; Confessore, Nicholas; Cadwalladr, Carole (2018-03-17). "How Trump Consultants Exploited the Facebook Data of Millions". The New York Times. ISSN 0362-4331. Retrieved 2019-03-04. ^ "Cambridge Analytica CEO 'admits to dirty tricks'". The Week. ^ "Cambridge Analytica Boasted of Disappearing Emails in Campaigns". Bloomberg L.P. 20 March 2018. ^ Rosenberg, Matthew; Confessore, Nicholas; Cadwalladr, Carole (17 March 2018). "How Trump Consultants Exploited the Facebook Data of Millions". The New York Times. ISSN 0362-4331. Retrieved 17 March 2018. ^ Cadwalladr, Carole; Graham-Harrison, Emma (17 March 2018). "Revealed: 50 million Facebook profiles harvested for Cambridge Analytica in major data breach". The Guardian. Retrieved 18 March 2018. ^ CNBC (23 March 2018). "UK High Court grants Cambridge Analytica search warrant to ICO". CNBC. Retrieved 23 March 2018. ^ ""Facebook Says Cambridge Analytica Harvested Data of Up to 87 Million Users" in ''The New York Times''". Nytimes.com. Retrieved 2018-06-05. ^ Hern, Alex (10 April 2018). "How to check whether Facebook shared your data with Cambridge Analytica". The Guardian. Retrieved 3 July 2018. ^ "Here's how Facebook allowed Cambridge Analytica to get data for 50 million users". Recode. Retrieved 27 March 2018. ^ Lumb, David (2 May 2018). "Cambridge Analytica is shutting down following Facebook scandal". Engadget. Retrieved 2 May 2018. ^ "Cambridge Analytica and Scl Elections Commence Insolvency Proceedings and Release Results of Independent Investigation into Recent Allegations". CA Commercial. Cambridge Analytica. 2 May 2018. Retrieved 2 May 2018. ^ Nichols, Shaun (2 May 2018). "Cambridge Analytica dismantled for good? Nope: It just changed its name to Emerdata". The Register. Retrieved 2 May 2018. ^ "Filing record for Cambridge Analytica (UK) Limited – Company number 09375920". beta.companieshouse.gov.uk. Companies house, UK. Retrieved 23 March 2018. ^ "Alexander James Ashburner NIX – Appoinments". beta.companieshouse.gov.uk. Companies house, UK Government. Retrieved 23 March 2018. ^ "Old Etonian smoothie fails to buff Indonesian leader's image". independent.co.uk. 6 August 2000. Retrieved 21 March 2018. ^ "SCL Group – Home". scl.cc. ^ Rosenberg, Matthew (19 March 2018). "Cambridge Analytica, Trump-Tied Political Firm, Offered to Entrap Politicians". Retrieved 19 March 2018. ^ Wieder, Ben; Kumar, Anita (20 February 2018). "Bannon sold Cambridge Analytica stake, fined for late ethics report". McClatchy. Retrieved 20 March 2018. ^ "Appoinment as directors". Companies house. 16 March 2018. Retrieved 23 March 2018. ^ Jeff Horwitz (15 June 2018). "AP: Trump 2020 working with ex-Cambridge Analytica staffers". Associated Press. Retrieved 18 June 2018 – via WashingtonPost.com. ^ Teri Robinson (18 June 2018). "Data Propria, heir to Cambridge Analytica, working for RNC, possibly Trump campaign". scmagazine.com. Retrieved 18 June 2018. ^ (May 29, 2018). "CloudCommerce Launches Data Propria, Inc., Its New Data Analytics Division". accesswire.com. Retrieved 18 June 2018. ^ a b Mikael Krogerus, Hannes Grassegger (3 December 2016). "Ich habe nur gezeigt, dass es die Bombe gibt" (in German). Das Magazin. Retrieved 7 December 2016. ^ Kosinski, M; Stillwell, D; Graepel, T (2013). "Private traits and attributes are predictable from digital records of human behavior". Proceedings of the National Academy of Sciences. 110 (15): 5802. doi:10.1073/pnas.1218772110. PMC 3625324. ^ a b c d e Davies, H (11 December 2015). "Ted Cruz using firm that harvested data on millions of unwitting Facebook users". The Guardian. Retrieved 7 February 2016. ^ a b c Biesecker, Michael; Bykowicz, Julie (11 February 2016). "Cruz app data collection helps campaign read minds of voters". Associated Press. Retrieved 13 February 2016. ^ "The Persuasion Machine of Silicon Valley". CBC News. Canadian Broadcasting Corporation and British Broadcasting Corporation. 17 February 2018. Retrieved 17 February 2018. ^ "Cruz's Data Company Works into the Night After Big $3 Million Payout". Advertising Age. Retrieved 26 February 2016. ^ "Inside the Tech That Puts Political Ads on Your Screen". DC Inno. Retrieved 26 February 2016. ^ a b "Revealed: Cambridge Analytica says it worked for Uhuru". Daily Nation. Kenya. 20 March 2018. ^ Cadwalladr, Carole; Graham-Harrison, Emma (17 March 2018). "The Cambridge Analytica Files : 'I made Steve Bannon's psychological warfare tool': meet the data war whistleblower". The Guardian. Retrieved 19 March 2018. ^ "Cambridge Analytica CEO 'admits to dirty tricks'". The Week. 20 March 2018. Retrieved 20 March 2018. ^ Pham, Sherisse; Riley, Charles (20 March 2018). "Cambridge Analytica responds after CEO filmed discussing bribery and entrapment". CNN. Retrieved 22 March 2018. ^ Lanxon, Nate (20 March 2018). "Cambridge Analytica Boasted of Disappearing Emails in Campaigns". Bloomberg. Retrieved 20 March 2018. ^ Bump, Philip (20 March 2018). "A new undercover video raises significant questions about Cambridge Analytica's elections work". The Washington Post. Retrieved 20 March 2018. ^ Mayer, Jane (17 March 2017). "The Reclusive Hedge-Fund Tycoon Behind the Trump Presidency". The New Yorker. ISSN 0028-792X. Retrieved 20 March 2018. ^ Nyhan, Brendan (13 February 2018). "Fake News and Bots May Be Worrisome, but Their Political Power Is Overblown". The New York Times. ISSN 0362-4331. Retrieved 20 March 2018. ^ "Cambridge Analytica Was Doing Marketing, Not Black Magic". Reason. 19 March 2018. Retrieved 19 March 2018. ^ Govind Krishnan V. (3 June 2017). "Aadhaar in the hand of spies Big Data, global surveillance state and the identity project". Fountain Ink Magazine. Retrieved 27 August 2017. ^ "Ted Cruz on South Carolina Primary". The New York Times. 20 February 2016. ISSN 0362-4331. Retrieved 21 March 2018. ^ Dwoskin, Elizabeth (16 March 2018). "Facebook bans Trump campaign's data analytics firm for taking user data". The Washington Post. Facebook said it was suspending the accounts of Strategic Communication Laboratories, the parent company of Cambridge Analytica, as well as the accounts of a University of Cambridge psychologist Aleksandr Kogan, and Christopher Wylie of Eunoia Technologies, Inc. Cambridge Analytica, a firm specializing in using online data to create voter personality profiles in order to target them with messages, ran data operations for Trump's presidential campaign. ^ Brannelly, Kate (4 November 2016). "Trump Campaign Pays Millions to Overseas Big Data Firm". NBC News. Retrieved 5 November 2016. ^ "Facebook's value falls $37bn amid backlash". BBC. 19 March 2018. Retrieved 20 March 2018. ^ Nelson Granados (26 March 2018). "Transparency: How Facebook Can Recover From The Cambridge Analytica Crisis". Forbes. Retrieved 26 March 2018. ^ "U.S. FTC investigating Facebook's privacy practices". Reuters. 26 March 2018. If the FTC finds Facebook violated terms of the consent decree, it has the power to fine the company thousands of dollars a day per violation, which could add up to billions of dollars. "The FTC takes very seriously recent press reports raising substantial concerns about the privacy practices of Facebook. Today, the FTC is confirming that it has an open non-public investigation into these practices," Tom Pahl, acting director of the FTC's Bureau of Consumer Protection, said in a statement. ^ Wong, Julia Carrie (2019-03-22). "Facebook acknowledges concerns over Cambridge Analytica emerged earlier than reported". The Guardian. ISSN 0261-3077. Retrieved 2019-03-22. ^ Punit, Itika (28 March 2018). "Cambridge Analytica's parent firm proposed a massive political machine for India's 2014 elections". Quartz. Reuters. Retrieved 6 June 2018. ^ Punit, Itika Sharma. "Why Cambridge Analytica was eager to play in the world's largest democracy". Quartz. Retrieved 20 March 2018. ^ Punit, Itika Sharma (5 April 2018). "Facebook admits Cambridge Analytica may have accessed the data of over 560,000 users in India – Quartz". Quartz. Retrieved 5 April 2018. ^ "'Believe' Congress was a client, says Cambridge Analytica whistleblower". The Economic Times. 27 March 2018. Retrieved 23 April 2018. ^ "BBC documentary clip goes viral, shows Congress poster in office of Cambridge Analytica's ex-CEO Alexander Nix". DNA India. Retrieved 23 April 2018. ^ "Cambridge Analytica made 2019 roadmap for Congress; party denies any deal". The Times of India. Retrieved 23 April 2018. ^ Dahir, Abdi Latif. ""We'd stage the whole thing": Cambridge Analytica filmed boasting of its role in Kenya's polls". Quartz. Retrieved 20 March 2018. ^ Lang'at, Patrick (21 March 2018). "Exposed: Analytica staff died in Kenya". Daily Nation. Retrieved 21 March 2018. ^ Matende, David (2018-06-05). "Media, like false preachers". Nairobi Law Monthly. Retrieved 6 August 2018. ^ "Cambridge Analytica's Kenyan role queried". BBC News. 20 March 2018. Retrieved 23 March 2018. ^ "Cambridge Analytica's Kenyan role queried". BBC. 20 March 2018. Retrieved 21 March 2018. ^ "Henley & Partners Speaks Out on SCL, Cambridge Analytica, House of Commons Report". 2018-08-07. Retrieved 2018-11-07. ^ "UK parliamentary report calls for criminal investigation of Henley and SCL". Caribbean News Now!. ^ Chenoweth, Neil. "Who ordered the assassination of Maltese journalist Daphne Caruana Galizia?". Australian Financial Review. ^ Department of Information. "STATEMENT BY THE GOVERNMENT OF MALTA: Government of Malta makes official representations regarding UK DCMS Committee report". ^ "Passport-sellers Henley and Cambridge Analytica's Nix 'exchanged ideas' on Caribbean election". 2018-03-28. Retrieved 2018-11-07. ^ Department of Information. "STATEMENT BY THE GOVERNMENT OF MALTA Government of Malta denies allegations in report by the Select Committee on Digital, Culture, Media and Sport". 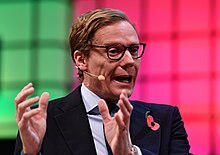 ^ "Cambridge Analytica trabajó con el PRI: Channel 4 News". Forbes México. 30 March 2018. ^ Murillo, Javier. "Cambridge Analytica, sigan la ruta del dinero". El Financiero. ^ Peinado, Fernando; Palomo, Elvira; Galán, Javier (22 March 2018). "The distorted online networks of Mexico's election campaign". El País. ^ "Exigen al INAI investigar a Cambridge Analytica, Facebook y desarrolladoras de Apps en México". Proceso. 2 April 2018. ^ "Mexico's Hardball Politics Get Even Harder as PRI Fights to Hold On to Power". Retrieved 2018-07-01. ^ Blakely, Rhys (22 September 2016). "Data scientists target 20 million new voters for Trump". The Times. Retrieved 4 October 2016. ^ a b Barnett, Anthony (14 December 2017). "Democracy and the Machinations of Mind Control". New York Review of Books. Retrieved 16 December 2017. ^ Cadwalladr, Carole (26 February 2017). "Robert Mercer: the big data billionaire waging war on mainstream media". The Observer. Retrieved 27 February 2017. ^ Cadwalladr, Carole (7 May 2017). "The Great British Brexit robbery how our democracy was hijacked". The Guardian. Retrieved 7 May 2017. ^ Cadwalladr, Carole (26 February 2017). "Revealed: how US billionaire helped to back Brexit". The Guardian. ^ Paul Lewis and Paul Hilder (23 March 2018). "Cambridge Analytica misled MPs over work for Leave.EU, says ex-director". The Guardian. Retrieved 24 March 2018. ^ Levy, Laurence (22 July 2014). "Participation in US Elections" (PDF). Bracewell & Giuliani LLP. Retrieved 23 March 2018 – via MSNBC. ^ "Wylie: Foreigners worked for Cambridge Analytica on NC Senate campaign". NBC News. Retrieved 23 March 2018. ^ a b Sellers, Frances Stead (19 October 2015). "Cruz campaign paid $750,000 to 'psychographic profiling' company". The Washington Post. ISSN 0190-8286. Retrieved 26 February 2016. ^ "Much-Hyped Data Firm's Promise Could Be Tested in Iowa". Advertising Age. Retrieved 26 February 2016. ^ "Cruz-Connected Data Miner Aims to Get Inside U.S. Voters' Heads". Bloomberg.com. Retrieved 26 February 2016. ^ Murphy, Brian; Bonner, Lynn (19 March 2018). "Tillis and NC Republicans paid $345,000 to the data firm that's now banned from Facebook". The News & Observer. Retrieved 20 March 2018. ^ Timberg, Craig; Hamburger, Tom (25 March 2018). "Former Cambridge Analytica workers say firm sent foreigners to advise U.S. campaigns". Washington Post. ISSN 0190-8286. Retrieved 26 March 2018. ^ Lichtblau, E; Stevenson, A (10 April 2015). "Hedge-Fund Magnate Robert Mercer Emerges as a Generous Backer of Cruz". The New York Times. Retrieved 6 February 2016. ^ a b Harry Davies (1 February 2016). "Ted Cruz erased Trump's Iowa lead by spending millions on voter targeting". The Guardian. Retrieved 7 February 2016. ^ Sasha Issenberg (2 February 2016). "How Ted Cruz Engineered His Iowa Triumph". Bloomberg.com. Retrieved 8 February 2016. ^ "Cambridge Analytica Congratulates Senator Ted Cruz on Iowa Caucus Win". PR Newswire. 2 February 2016. Retrieved 8 February 2016. ^ a b c Kate Kaye (24 August 2016). "Trump Spending With Cambridge Analytica Looks Like Peanuts Compared to Cruz". Advertising Age. Retrieved 4 October 2016. ^ Miller, Sean J. (2 February 2016). "Organization and Analytics Help Take Down Trump in Iowa". CampaignsandElections.com. Retrieved 23 February 2016. ^ "Data-Mining Firm Searches for Voters by Combing High School Yearbooks". Bloomberg.com. ^ a b Johnson, Eliana (5 August 2016). "The GOP nominee makes a late attempt at data-driven targeted messaging". National Review. Retrieved 4 October 2016. ^ Confessore, Nicholas; Hakim, Danny (6 March 2017). "Data Firm Says 'Secret Sauce' Aided Trump; Many Scof". The New York Times. Retrieved 6 March 2017. ^ OpenSecrets – FEC. "Top Vendors/Recipients". OpenSecrets/FEC. ^ "Data Firm Says 'Secret Sauce' Aided Trump; Many Scoff". The New York Times. 6 March 2017. ^ Conradis, Brandon (2 January 2018). "Congressional investigators find irregularities in FBI's handling of Clinton email case". The Hill. ^ Woodruff, Betsy (25 October 2017). "Trump Data Guru: I Tried to Team Up With Julian Assange". The Daily Beast. Retrieved 25 October 2017. ^ CNN, Kara Scannell, Dana Bash and Marshall Cohen,. "Trump campaign analytics company contacted WikiLeaks about Clinton emails". CNN. Retrieved 25 October 2017. ^ "Inside Russia's Social Media War on America". Time. ^ "Trump campaign's digital director agrees to meet with House Intel Committee". Politico. ^ Lee, Carol E.; Barrett, Devlin; Harris, Shane (23 January 2017). "U.S. Eyes Michael Flynn's Links to Russia" – via The Wall Street Journal. ^ Stahl, Lesley (8 October 2017). "Parscale: TV news "thought I was a joke"". CBS News. Retrieved 12 June 2018. ^ "Secret Weapon". CBS News. 8 October 2017. Retrieved 12 June 2018. ^ a b c Stahl, Lesley (8 October 2017). "Facebook "embeds," Russia and the Trump campaign's secret weapon". CBS News. Retrieved 12 June 2018. ^ @JulianAssange (25 October 2017). "I can confirm an approach by Cambridge Analytica and can confirm that it was rejected by WikiLeaks" (Tweet) – via Twitter. ^ Woodruff, Betsy (25 October 2017). "Trump Data Guru: I Tried to Team Up With Julian Assange" – via thedailybeast.com. ^ Cohen, Marshall. "Trump. Cambridge Analytica. WikiLeaks. The connections, explained". CNN. ^ Ballhaus, Rebecca (15 December 2017). "Mueller Sought Emails of Trump Campaign Data Firm". The Wall Street Journal. ISSN 0099-9660. Retrieved 15 December 2017. ^ "Trump campaign mined Facebook user data using Israeli 'intelligence gathering'". The Times of Israel. Retrieved 21 March 2018.